U.S. stocks trimmed losses Wednesday afternoon to close mixed after minutes from the Federal Reserve's latest meeting showed that the central bank is leaning toward taking measures to stimulate the economy. The Dow Jones industrial average finished just 0.2% lower. Prior to the minutes, the blue chip index was off about 0.6%. The S&P 500 and Nasdaq erased earlier losses to finish the day with slim gains. A third round of large bond purchases known as quantitative easing -- or QE3 -- is still on the table, according to minutes from the Fed's latest policy meeting. The central bank is also debating a plan to lay out more explicit guidelines for Fed policy going forward. "It's seems like the Fed is tilting more toward easing now," said Doug Roberts, chief investment strategist at Channel Capital Research. "But since the last Fed meeting, the economic data has been coming out on the positive side, so nobody is willing to make any big bets until they know more." Investors will be tuning into Fed chief Ben Bernanke's speech at the Jackson Hole, Wyo., symposium next week, hoping it will do more to reveal the Fed's latest take on the economy and its plans for the monetary policy meeting in September. "Until investors get some additional confirmation about which way things will go, they'll be hanging out on the sidelines," said Roberts. Meanwhile, investors also continue to keep an eye on Greece, as Prime Minister Antonis Samaras meets with eurozone officials throughout the week. He is expected to push for a two-year extension of the country's bailout program, which would give the government more time to implement difficult reforms and help get the nation's economy back on track. Analysts say markets will be looking for any comments out of Samaras' meetings for signs of further stimulus measures. "We are unlikely to get any firm promises on the extension of deadlines or additional funding," said Elisabeth Afseth, fixed income analyst at Investec. "But it is more likely that we get supporting comments about 'great efforts made, difficult economic conditions', though with a warning more needs to be done." Trading has been muted for the past few weeks, with stock market participants taking summer vacations. In fact, average daily volumes on the New York Stock Exchange in August have slumped to the lowest levels since September 2007. Stocks will likely remain in a narrow range through Labor Day as Wall Street remains in vacation mode, said Stephen Carl, head equity trading at Williams Capital Group. World Markets: European stocks closed in the red. Britain's FTSE 100 fell 1.4%, the DAX in Germany slipped 1% and France's CAC 40 shed 1.5%. Asian markets also ended lower. The Shanghai Composite lost 0.5%, the Hang Seng in Hong Kong fell 1.1%, and Japan's Nikkei edged lower 0.3%. Japan's trade deficit in July was wider than expected at ¥517.4 billion ($6.5 billion), as Europe's debt crisis and slower growth in China pressured the country's exports. Economy: Existing home sales came in at an annual rate of 4.47 million in July, up from June's 4.37 million, according to the National Association of Realtors. The results were below an economists' consensus compiled by Briefing.com. 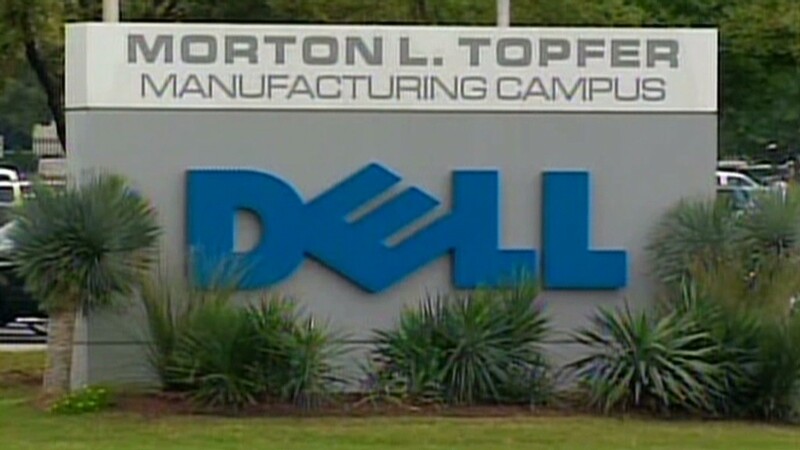 Companies: PC giants Dell (DELL) and Hewlett-Packard (HPQ) were big laggards in trading Wednesday. Dell posted earnings that beat expectations, but shares slumped after the company issued a disappointing guidance. After the closing bell, rival HP reported earnings that topped expectations, but sales missed forecasts. The company's guidance for the year was also weaker than analysts were hoping. 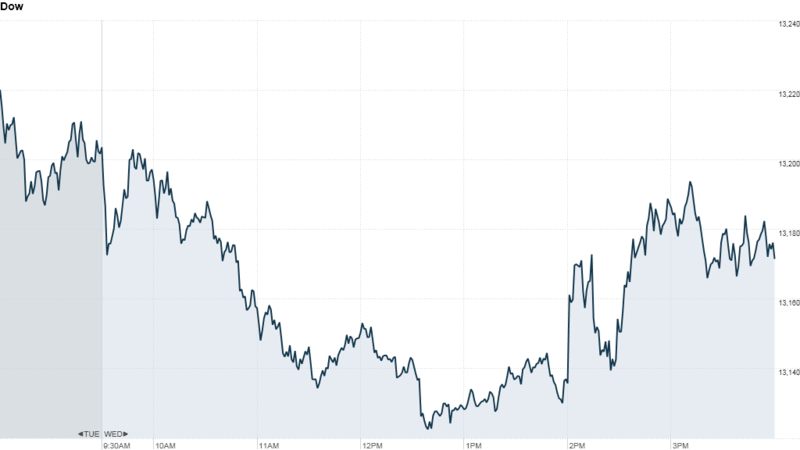 Share of HP were up about 2% in after-hours trading. Shares of Toll Brothers (TOL) rose after the luxury home builder reported surprisingly strong earnings, signaling further momentum in the U.S. housing market. Express (EXPR) posted earnings that beating analyst expectations, but net sales fell short of forecasts, sending shares of the apparel retailer down more than 10%. Shares of Williams Sonoma (WSM)surged after the housewares retailer reported better-than-expected second-quarter earnings and raised its forecast for the rest of the year. American Eagle (AEO) delivered earnings that were in line with expectations, but the company's forecast for the full year topped Wall Street's forecast, boosting shares. Currencies and commodities: The dollar declined against the euro, the British pound and the Japanese yen following the Fed minutes. Oil for October delivery rose 42 cents to settle at $97.26 a barrel. Gold futures for December delivery fell $2.40 to settle at $1,640.50 an ounce. Bonds: The price on the benchmark 10-year U.S. Treasury edged higher, pushing the yield down to 1.70% from 1.81% late Tuesday.